Twenty-two years ago, on a balmy summer night, Shaun Russell received the worst news of his life. This week, a poised and lovely Josie, now 31 and engaged, appeared on ITV’s Lorraine show, giving us a remarkable lesson in the optimism and courage of the human spirit. She and her fiancé are living in the original family home in the Welsh hills she used to share with her parents and sister before they moved to Kent, where the attack happened. A home that, she says, holds so many happy memories. Josie’s story came in the week one report said that a quarter of teenage girls are suffering from depression, anxiety and other mental health issues. Another shockingly revealed that one in four 14-year-old girls self-harm. I am not for a moment denigrating these girls who are clearly suffering, subjected as they are to many pressures — not least the constant hateful judgment of their peers on social media. My point is that Josie gives them hope. She proves you can overcome adversity, no matter how terrible. Far from indulging in victimhood and self-pity, she is determined to make the best of her life. Her greatest joy today, apart from planning life with her fiancé, is her Mum’s pony, Rosie, which she used to ride as a child. ‘Now Rosie’s quite old, I take her for walks,’ she said. What a tribute she is to her father Shaun. And what a role model for troubled young girls everywhere. Asked what her favourite shops in London are, Victoria Beckham says her own, of course. And Daunt Books. Posh reading anything but fashion glossies? Give me a break. Or is this her famous sense of humour? When Strictly began it was about the dancing, not the sob story. Now we have lovely Kate Silverton (left) pleading special privileges because, at 48, she’s ‘a late-in-life mum and recently menopausal’. Sorry, Kate, but that’s about as exciting as an all-night hot flush. Shortly before his death, art dealer Oliver Hoare revealed that he regretted the hurt caused by his affair with Princess Diana 25 years ago, especially to Diane, his wife who stood by him to the end. Of the Princess, he said: ‘I told her before anything had happened it would end in a lot of pain for us both, but it would be a lot of fun along the way.’ Fun for the women-magnet Hoare perhaps, but not for the two women he left heartbroken. 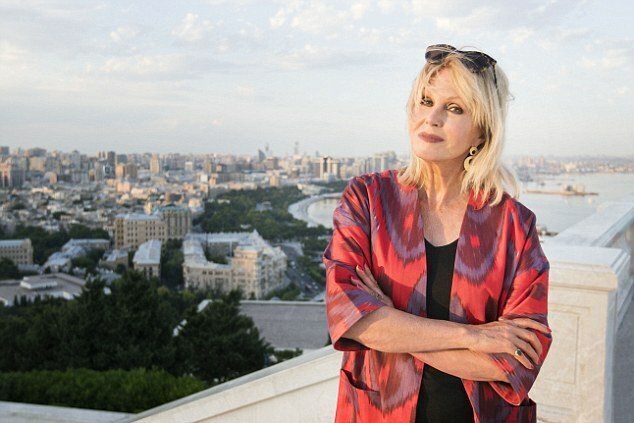 Before she took to the Silk Road on ITV this week, some wondered how Joanna Lumley (below), now 72, would manage the gruelling 7,000-mile journey from Venice to China. She was, as always, sublime. From Purdey in The New Avengers back in the Seventies to Ab Fab’s Patsy in the Nineties, we’ve remained entranced by her. Forget TV ageism. If you’re fabulous, we can’t get enough of you — even in your 70s. 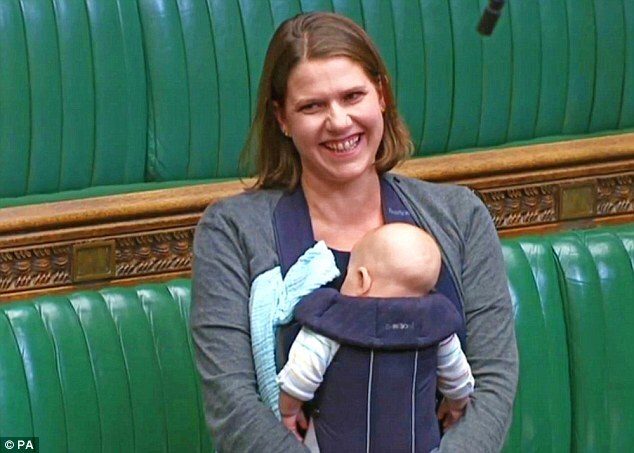 Lib Dem Jo Swinson (below) made history in a Commons debate about maternity rights for MPs. She clutched her 11-week-old baby to her bosom in the chamber. She didn’t make a speech, as it happened — although her virtue-signalling on behalf of the sisterhood spoke louder than words. Is it any wonder these pampered politicians are now considered so out of touch with real folk? Imagine what would happen if a young mum arrived at Tesco’s for her eight-hour shift on the tills with a baby strapped to her chest. In a self-selecting survey, today’s pious 18-year-olds say they are less likely to drink than the previous generation, yet are much more lonely. To quote the infamous tippler Kingsley Amis, it will be down to ‘the basic fact that conversation, hilarity and drink are connected in a profoundly human, peculiarly intimate way’. I’ll drink to that. As the new face of M&S, Holly Willoughby proudly wears clothes from the High Street giant, despite being worth £21million. I’d pay good money to see what designer clothes she dons when she’s not being little Mrs Normal on ITV’s This Morning. But even Givenchy couldn’t conceal those adorably chubby knees, although she does wear ankle boots to cover up her cankles. Jeremy Corbyn’s private secretary is a pro-Palestinian activist alleged to have donated money to a charity that supports the families of accused terrorists. Iram Awan has also managed to bypass the strict Commons security vetting for nine months and isn’t cleared for a pass, so Corbyn squirrels her in each day. Truly, they’re a match made in Hamas heaven. Plaudits all round! The stars of the three new major TV dramas — Bodyguard, Wanderlust and Black Earth Rising — are all clever, middle-aged, ball-breaking women. The only difference with Black Earth Rising’s emancipated lead, Harriet Walter, is that she got through the first week without jumping into bed with her co-star. So heartening for us church-goers to see the Archbishop of Canterbury getting a standing ovation at the TUC conference. He derided Universal Credit (which has seen a sharp decline in the number of workless households) and described the gig economy’s zero-hour contracts (which the Church routinely uses) as ‘the reincarnation of an ancient evil’. Was the irony lost on Justin Welby that, while blasting fat cats, he was standing shoulder-to-shoulder with the TUC’s chief Frances O’Grady, who has awarded herself £18,000 in pay rises since she got the job in 2013. Her comradely pay package comes to an eye-watering £175,000. Up the workers!